At GDC today, Valve has been showing off a demo of HTC's new virtual reality headset. We're going to see the demo tomorrow morning, but we already know a lot about it from our colleagues' reports: it looks a lot like a new Portal. It is not a new Portal. I reached out to Valve and asked for a comment on how the demo is being interpreted: CNet, for instance, said it "sounds like" Portal 3, while Tom Parsons of Stuff claimed that he had actually played a Portal 3 demo during his Vive hands-on. 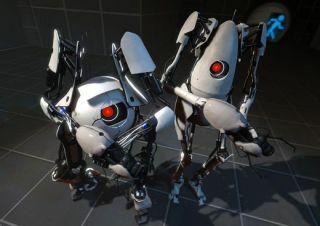 I told Valve that I was skeptical that they'd soft-announced Portal 3. Valve director of marketing Doug Lombardi responded, "We have not." I followed up to be absolutely clear, asking, "The demo being shown does not represent a prototype or indicate any plan for a new Portal?" Lombardi replied, "Correct. Just a demo." So no, this isn't Portal 3. It's just a tech demo until we know more—and I suspect Valve is just having fun with some existing art.